There are numerous commercial boats on Zealand that arrange fishing trips on the ocean, mainly for cod, herring and flounders. The water depth falls dramatically off the coasts of Zealand, which allows you to have a special kind of fishing experience. Here you can find cod, whiting, herring, mackerel, and not least flounders like plaice, starry flounder, limanda and turbot, and sole. And of course there is trolling for salmon. If you have a boat yourself, you can explore the ocean on your own. Otherwise there are lots of commercial tour boats that arrange trips on the ocean, mainly for cod and flouder. These boats operate for the most part around Øresund, the sound between Zealand and Sweden, and in Storebælt, the body of water that separates Zealand from Funen. They can also be found in other places. 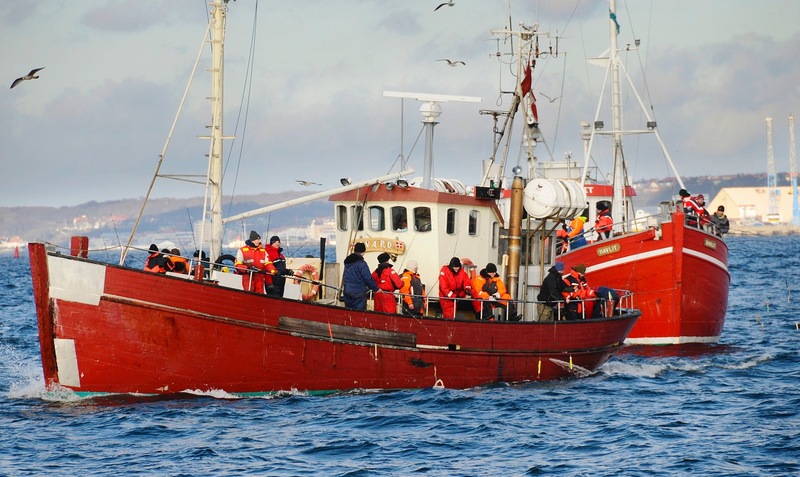 The price for a day of fishing is typically 300 Danish Crowns per person. You can also book a ship for a day for a group. In this way you can enjoy a special day at your own pace having fun with friends and people you know. Pilking is one of the most popular methods for getting a hold on cod, and for this type of fishing you use relatively short saltwater rods of 6-7’, large multiplier sea reels and strong 0.40-0.50mm braided line, which makes it possible to hang on to the bottom, i.e. feel that you are fishing just over the bottom – even though you are fishing at great depths and in potentially strong current. Cod prefer to hug the bottom, so in addition to a saltwater pilking rod and a multiplier reel you should also have several good, heavy pilker spoons or jigs on weights of 50 to 250 grams – otherwise it can be difficult to reach the bottom at all. Above the pilker spoon you can mount a leader with rubber squids, small jigs or flash flies, which can increase your chances of getting a strike – not only from a cod, but also from fish like herring, mackerel, whiting and garfish. You should pull your lure carefully up and down so the pilker is in motion, hops out to the side and blinks in the fall. This is usually more than a cod can resist. Fish in the ocean have a good sense of smell, and there is no better bait than a ragworm that is alive and kicking or a fresh herring or sand eel. Thus fishing with live bait is an extremely effective method when you are fishing in the ocean, no matter where the fish is located in the water. If you want to try fishing for garfish or mackerel, for example, these are usually found in the upper levels at depths between 1-6 meters, and here you could try a sliding float in combination with strips of herring or live sand eel. If you are drawn to flounders or cod, a simple paternoster tackle with a weight and one or two hooks is a good choice. You simply bait this with ragworms, lugworm, a sand eel or a strip of herring and lower it all the way down to the bottom. Cod are particularly happy to see pieces of herring, whereas the flounders have a hard time resisting a ragworm or a lugworm. If you have your own boat, there are lots of possibilities for experiencing good ocean fishing with light gear. This kind of light fishing in the ocean is extra exciting since both the strikes and the fights feel extremely intense. A fish finder that can localize the fish is particularly useful for this kind of fishing, and otherwise it is a matter of finding spots with relatively moderate current and depth. A 9 foot spinning rod with a casting weight of 10-30 grams, a well-spooled reel and lots of 0.30mm braided line is a good bet for fishing this way, and in addition an array of smaller casting spoons and jigs between 10 and 50 grams. You can fish directly under the boat or cast and reel in, but like traditional pilker fishing it is a matter of fishing just above the bottom. Trolling is becoming increasingly popular along the Zealand coasts, which is not surprising. There are excellent opportunities everywhere for catching wonderful silvery sea trout, and in the waters around Møn you can experience spectacular fishing for salmon with a chance of catching a high caliber fish. Trolling is carried out from special trolling boats that can be rigged with a number of rods set up with bait to fish at different depths and at different angles in relation to the boat itself. 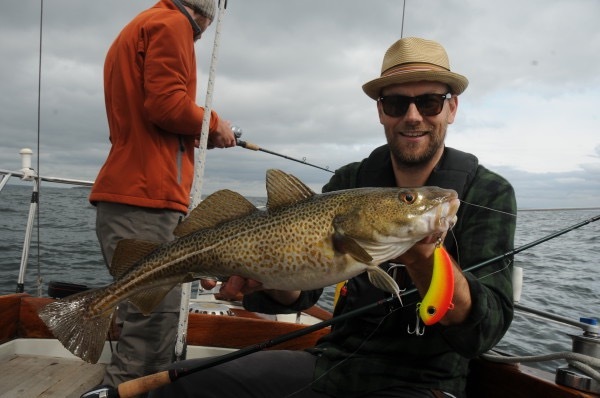 Trolling is very demanding when it comes to gear, so it is fortunate that there has been an increase in the number of guided trolling tours that are available where all the necessary equipment is provided by the guide.